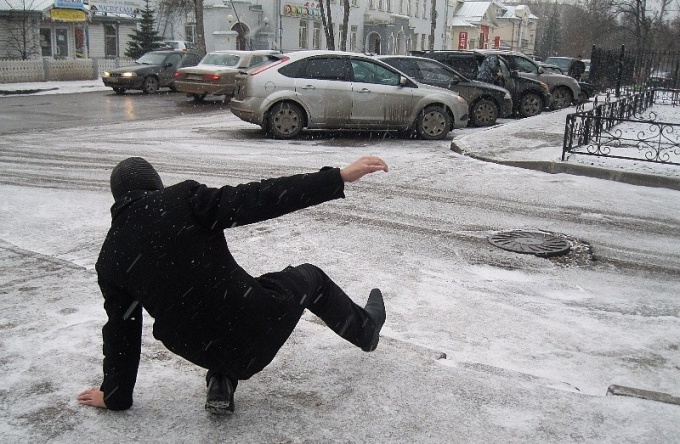 The number of people receiving injuries from falling on the street significantly increases in winter. To best protect yourself in icy conditions, you should adhere to certain recommendations. Refrain from shoes with high heels. In order to avoid falls and injuries on slippery roads in winter, opt for walks boots or shoes with low heels or flat shoes. Also the risk of falls is reduced to a minimum, if the sole of winter shoes will be ribbed. Equally important is the material from which it is made: better if it's rubber or rubber. Change the style of your walk during the ice - move like your feet are wearing little ski. Be careful, try to choose the most secure areas of the track, but do not forget that under the snow can also be ice. Do not keep hands in pockets, not nagruzilas bags – leave free at least one hand to maneuver in case you slip. If you are unable to keep your balance, and you feel that's going to fall, try to catch a seat, to minimize the drop height. Do not expose arm forward, as, dropping all of her weight, we could break it. The same applies to the feet - try to keep them together in the fall. At this point, it is desirable to exert much every muscle in the body to protect the bone tissue. Falling on his back, you need to try to protect themselves from traumatic brain injuries. For this, losing balance, press to a breast a chin, and stretch your hands. To reduce the risk of concussion can help a cap or a hood. To avoid serious injury when falling on slippery stairs, try dropping to cover the head and face with his hands. Do not attempt to brake the fall with your hands and feet - so you will only increase the likely number of fractures and bruises. If the ice is very strong, use special anti-slip pads on the soles of the icewalkers. They have a universal size, sold in sporting and hardware stores and protects from drops.